Our Growing Healthy Soil for Healthy Communities gardening workshops aim to reduce the harmful levels of lead in soil and enhance neighbors gardening experiences! 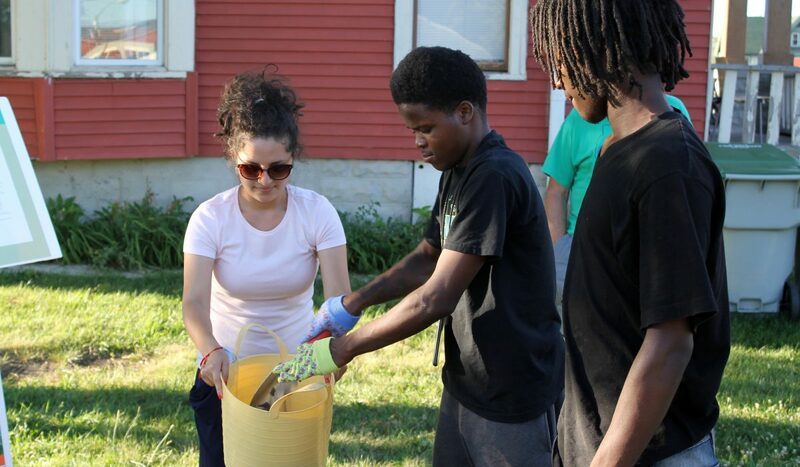 Urban agriculture and gardening in Milwaukee is a thriving movement. Many organizations and individuals are actively involved in community and backyard gardening. However, Lindsay Heights and nearby communities should take precautions to avoid exposure to harmful lead levels. The Growing Healthy Soil for Healthy Communities project is a community academic partnership that utilizes principles of community-based participatory research. Partners include Sixteenth Street Community Health Centers, Walnut Way Conservation Corp., the Medical College of Wisconsin, the University of Wisconsin – Madison, UW-Extension and the Milwaukee Health Department. Study Goals include demonstrating the effectiveness of soil and landscape interventions, increasing environmental health literacy, increasing awareness of existing policies influencing safe backyard gardening, and engagement in policy formation to support sustainable change. Gardening workshops are held monthly during the growing season (April – October) at Walnut Way and at the 16th Street Community Health Center that explore gardening, safe gardening practices, and special topics such as beginners gardening, growing without chemicals, harvesting, and preserving. 2018 Calendar coming soon. If you are a homeowner or renter that has a garden and live in 53205, 53206, 53208*, 53209*, 53210, and 53212 you can participate in our soil testing and intervention portion of the project. *Indicates subsection of zip code, call for details. Contact Jeremy Davis: jeremy@walnutway.org to sign up for our educational workshops and/or receive soil testing and possible interventions.